On February 24, I spoke at SEMpdx's SearchFest on Advanced Analytics with Conrad Saam. I covered quite a few Google Analytics tips that I consider rather custom or advanced, and my slide deck is attached at the end of this post. If you are in the Portland area, you missed a great conference, and I'd strongly encourage you to consider attending next year. I want to focus on the multi-channel funnel piece of my presentation in this post primarily, and also I'd like to keep this short, sweet and actionable, so here goes. Added back in August, it seems like everyone, including myself, has been meaning to check out Google Analytics' multi-channel funnels, but just hasn't gotten around to them. Now's the time to check them out, because there just might be some real gold in there. The following is the biggest takeaway I can offer about multi-channel funnels. There's three reasons for this, The first is MAJOR. 1. The stock "social network" group is essentially worthless!!! What we see there is actually the view when drilled down into the "Referral" basic channel grouping. Not "Social Network". That's because clicks coming from t.co and plus.google.com are not in the stock "Social Network" channel grouping logic. So let's fix that right away, shall we? Could you imagine spending hours looking into multi-channel funnels, only to later discover that clicks from Twitter weren't considered "social"? Yikes. Fix this fast. You're hopefully segmenting your branded and unbranded organic search keywords when looking at your keyword reports. For most any business, this is just as important when looking at multi-channel. 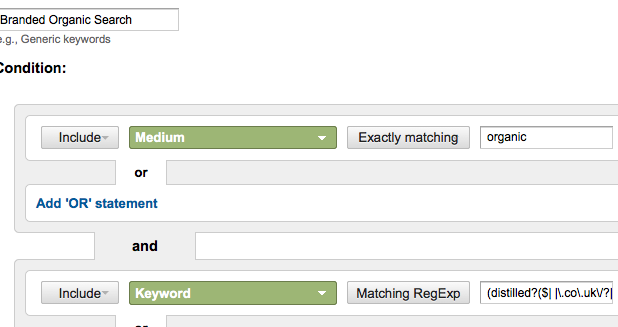 You've probably got your regex already built for your branded keywords as an advanced segment. Grab that, and follow me down this wonderful set of images I've lovingly plucked from the web. 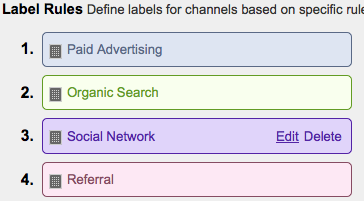 Now, just recreate the same steps above for our unbranded channel but flip the "include" on the keyword line to "exclude" and voila! Done, right?! Actually, no. Remember everyone's new favorite keyword? Yup. Foiled again by (not provided). I hate you so, (not provided). Make sure you ALSO create a (not provided) channel because otherwise it will fall into your unbranded keywords group using the logic we just did above. And that just ain't right. Personally, I try to get back at (not provided) whenever I can by calling it names. Who's gonna stop me, really? Some faceless group of keywords hiding in a big bucket? Yeah. Right. Hey! (not provided)! Your momma's so fat that when she...okay. This one's kind of a no-brainer, but everyone's tracking should be different. Use affiliates? Might want to create a channel for 'em. Should be pretty simple logic if you've got your affiliate links tagged with a campaign tracking code like utm_medium=affiliates. Hopefully you get the point, but if not, take a dive through your (other) channel grouping. That's where all the leftovers fall by default. 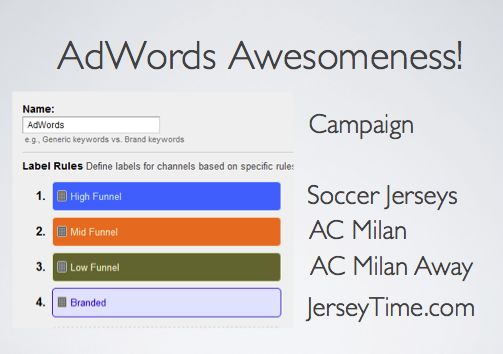 You might discover some campaign tracking parameters or referring sites that really deserve their own channel. Want to track file downloads as pageviews, but don't want to go through the trouble of manually tagging each download link with a virtual pageview? Entourage.js is a simple JS file created by Tian Davis and TechOctave that will do all the hard work for you. Events can be used to track some snazzy interactions on your site. Checkout Justin Cutroni's latest series of posts on content tracking and analysis with Google Analytics' Events. In my presentation, I highlighted the usefulness of tracking checkout errors with events. It's pretty simple, really. Alrighty, that'll do it for me. Thanks to the SEMpdx folks for inviting me to SearchFest. It was an extreme pleasure. Portland's wonderful, the audience asked great questions, and I ate a fantastic grilled cheese with bacon and apple butter. If you had come, I probably would've given you a bite. So there. Oh, here you go, here are my slides. View more presentations from Mike P.